Welcome to Miss Turquoise on the left. 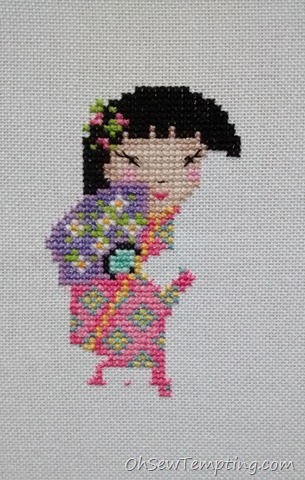 She is the final doll in this design called Kokeshi Friends by Joan Elliott. This one stitched up really quickly. I made no mistakes for a change. There’s only one stage left to stitch so the finish line is in sight. Claire is sewing the same design as me and the other ladies in the SAL are all doing different projects. Please click on the links below to visit everyone else’s blogs and see what they are all up to. You will notice we have a new addition to the group. Her name is Constanze and she lives in Germany. Do you have a work in progress that has been pushed to the bottom of your pile of projects? Why not join us? You can do so by sending me an email. The address is at the right hand side of this page. Our next update will be on 1st May when I hope to have a finished project to show. See you then! Welcome to Little Miss Lilac on the Left. 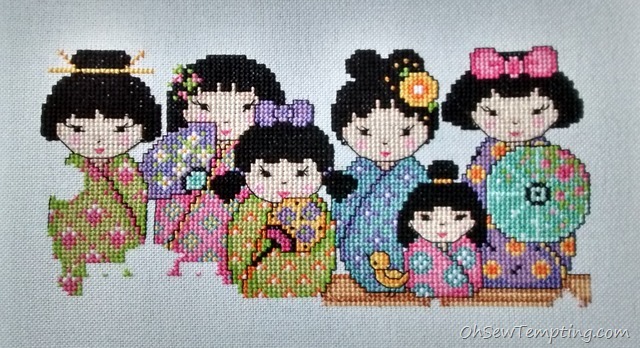 She is the penultimate doll in this design called Kokeshi Friends by Joan Elliott. Miss Lilac stitched up really quickly as she is quite petite compared to some of the other dolls. I would have had her finished a lot quicker if I hadn’t attached the wrong shade of pale peach floss to the thread holder. There I was merrily stitching away, radio on, sitting by the radiator. You can imagine the cosy scene. Then I realised Miss Lilac was rather tanned compared to the others! So much for focussing better this time. The right hand side of the project has now rolled around the frame so you’ll have to be patient and wait to see the full design when it is finished. There’s only one doll left to stitch plus a few details, so the finish line is in sight. 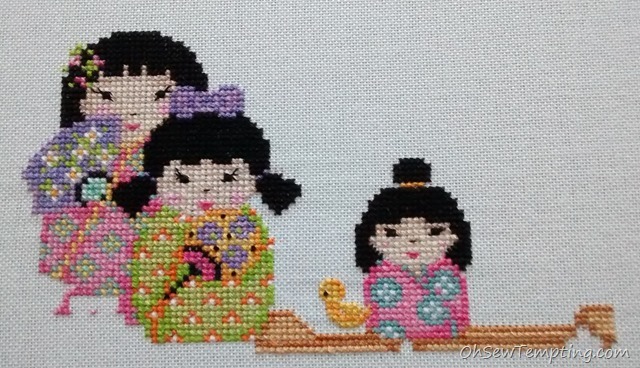 You will notice I’ve been very good by continuing to finish the backstitch as far as possible. I’ll consult with my cross-stitching guru Claire about the number of stages we have left. I suspect there’ll only be two (or will we make a run for the finish line, I wonder). Claire is sewing the same design as me and the other ladies in the SAL are all doing different projects. Please click on the links below to visit everyone else’s blogs and see what they are all up to. Regular readers will notice a new stitcher in the group. Sue, who writes at From The Magpie’s Nest is joining the fun 🙂 Welcome aboard Sue! I’m really looking forward to seeing what you have chosen to stitch. If you are sitting reading this and thinking that you’d like to finish some of your ancient, or even recent, works in progress, why not join us? You can do so by sending me an email. The address is at the right hand side of this page. Our next update will be on 10th April. See you then! It’s SAL update time again. I’m really happy with my progress on this project so far. 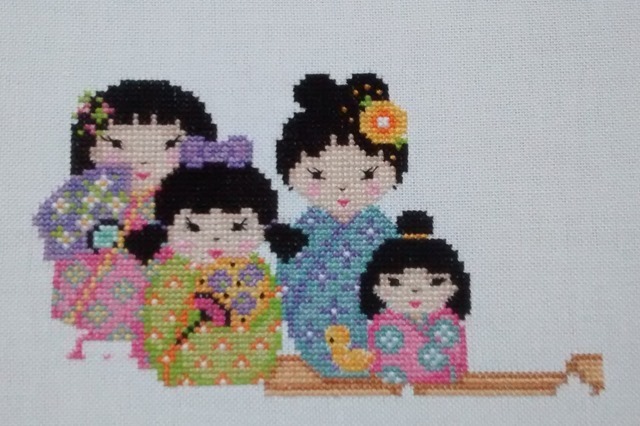 For this stage I completed the large doll on the far right and quite a lot of the backstitch. 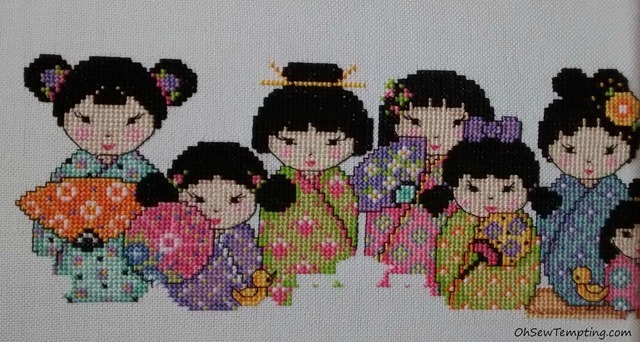 The design is called Kokeshi Friends by Joan Elliott and it’s fun to stitch. Claire is sewing the same design as me and the other ladies are all doing different projects. Please click on the links below to visit their blogs and see what they are all up to. Our next update will be on 28th February. See you then! 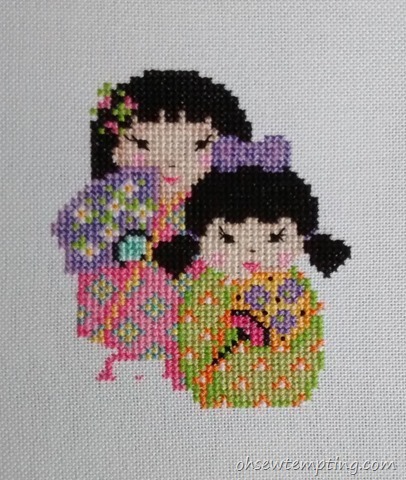 It’s time to show a progress update on the Kokeshi Friends project that I’m stitching along with Claire. The design is by Joan Elliott. I’m really enjoying stitching this one so far. The other ladies in the group are all making different projects. Do pop over and take a look at what they are up to by clicking on their names below. They’ll be posting updates some time today. I’m really pleased to announce the start of a new cross stitch project for the SAL. 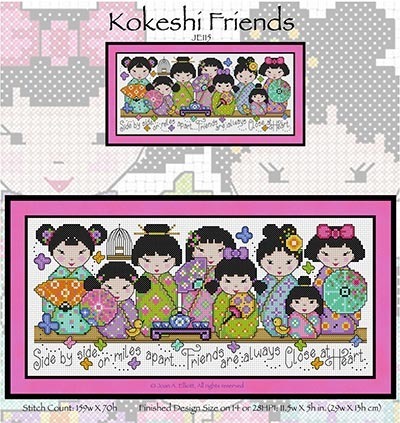 It’s Kokeshi Friends designed by Joan Elliott. 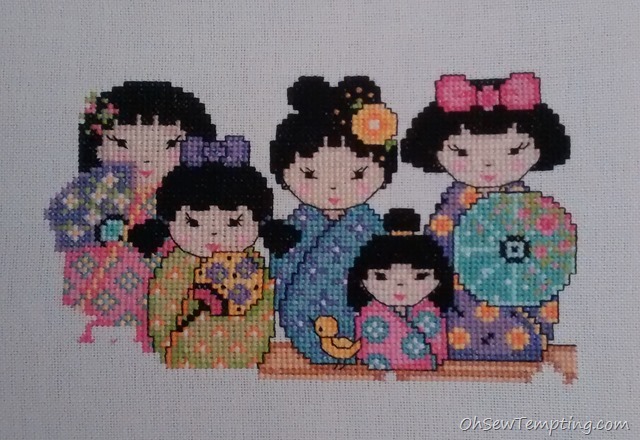 The chart was originally published in issue 200 of The World of Cross Stitching magazine as Kokeshi Dolls and it’s now available under the name of Kokeshi Friends from various outlets including 123 Stitch and Casa Cenina. As usual, me and Claire will be stitching the same design. We’ve started with the centre doll, Miss Pink. Here’s my progress so far. I’m stitching on white 28 count evenweave over two threads. There are a few fractional stitches so the evenweave helps with those. The wrapover edge of the kimono should be stitched with metallic thread. I tried and failed and ended up unpicking it and stitching with plain colour regular floss instead. The metallic thread was all too lumpy bumpy for my liking. My friend Lin will be very pleased to read that I’ll be using all but two of the required colours from a box of threads that she gave me a few weeks ago. I couldn’t believe how many of the recommended shades I didn’t have in my own stash. However, when I looked in Lin’s box, there they were. Thank you again Lin 🙂 I told you they wouldn’t go to waste in my hands 🙂 To buy this lot would have cost me a small fortune! The rest of this group is also posting updates on their lovely projects some time today. Please allow for time differences as we live all over the world. Just click on the names to visit their amazing blogs and see what they’ve been up to. Our next update will be on 6th December. See you then!